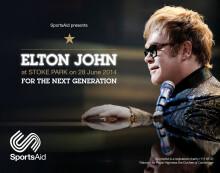 Some of the biggest names in British sport have confirmed their attendance at SportsAid’s Elton John concert on June 28, including Olympic gold medallists Anna Watkins, Dame Mary Peters, Duncan Goodhew, Heather Stanning, James Cracknell, Mark Hunter and Steve Williams. Also joining SportsAid for this charity event – which is raising money for the next generation of British athletes – are world champions Richard Hounslow, Shelley Rudman, Derek Redmond and Gail Emms. Speaking about his support for the event Sir Steve Redgrave said, “To have a global superstar like Sir Elton John backing the next generation is incredible. Sir Elton John will perform live in the gardens of the five-star Stoke Park country club, spa and hotel on June 28 in Buckinghamshire. Tickets start at £75 (subject to availability) and are available from Ticketmaster. All the proceeds go to SportsAid (charity 1111612) with the aim of creating a £500,000 fund to help talented disabled and non-disabled athletes throughout the UK to meet the costs associated with their sport. “I am so excited to be part of this landmark event for SportsAid and to be helping the young, aspiring sports stars of the future,” said Sir Elton John.